Bitcoin is certainly a good investment according to experts. Even Bill Gates openly endorsed Bitcoin. But you should also know that there are other cryptocurrencies. It’s wise to also invest in other cryptocurrencies like Ethereum and Litecoin. In this article, I will share how to convert Bitcoin into Ethereum, Litecoin, or any other cryptocurrency. The above three tutorials will help you get a good grasp of how you can get your first Bitcoin. Now, let’s move ahead with the tutorial of how to swap Bitcoin with other cryptocurrencies. Changelly is a fully fledged platform that let you convert any cryptocurrency into any other. For example, in this case, we have 1 BTC & we want to convert it into Ethereum. With Changelly, this could be done instantly. Click on Exchange & on the next page you will get the details of the transaction. Do note, Changelly would require you to create an account using an email address. This is a good thing as you can anytime login to your Changelly account in future & see all your conversions. 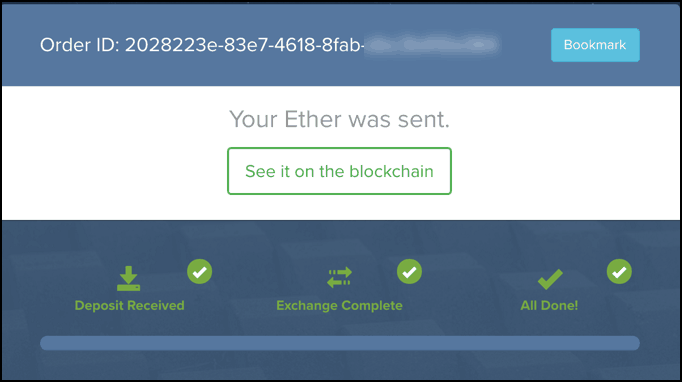 Click on next & enter your Ethereum wallet address where you want to receive the converted Ether. You can see the list of most popular & trusted Ethereum wallet here. Click on next & on this page you will see the details of the conversion you are making. If everything looks ok, click on confirm & make payment. On the next page, you will see the QR code & the Bitcoin Wallet address in which you need to send the BTC to convert it into ETH. After sending the payment, you can close the tab as you will get email notification when everything is done. Like Changelly, Shapeshift is a currency swapping website which does one thing: Allows users to exchange between Bitcoin and other cryptocurrencies. So let’s say you want to exchange Bitcoin for Ethereum. If you are converting to something else apart from Etherium, you just need to know the wallet address where you can receive the converted currency. If you don’t have an Ethereum wallet address, you can sign up for Coinbase & get an Ethereum wallet address for free or refer to this guide for best Ethereum wallets. Once you have fulfilled both requirements, head over to Shapeshift.io. 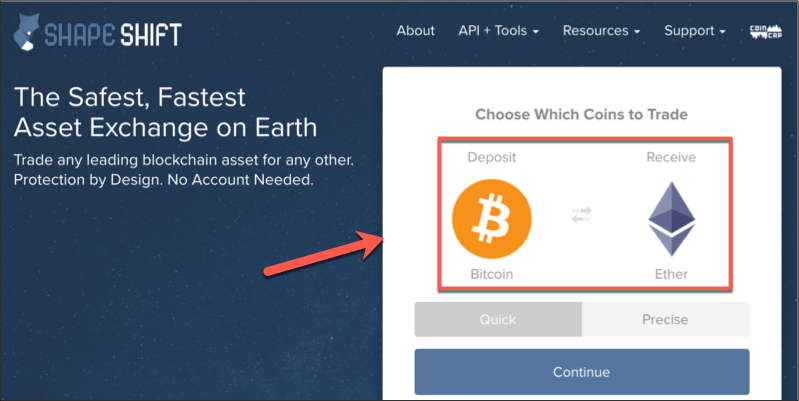 Select Bitcoin in Deposit & Ethereum in Receive under the “Choose Which Coins to Trade” option. Click on Continue. This is where you need to add your Ethereum wallet address & your Bitcoin address. 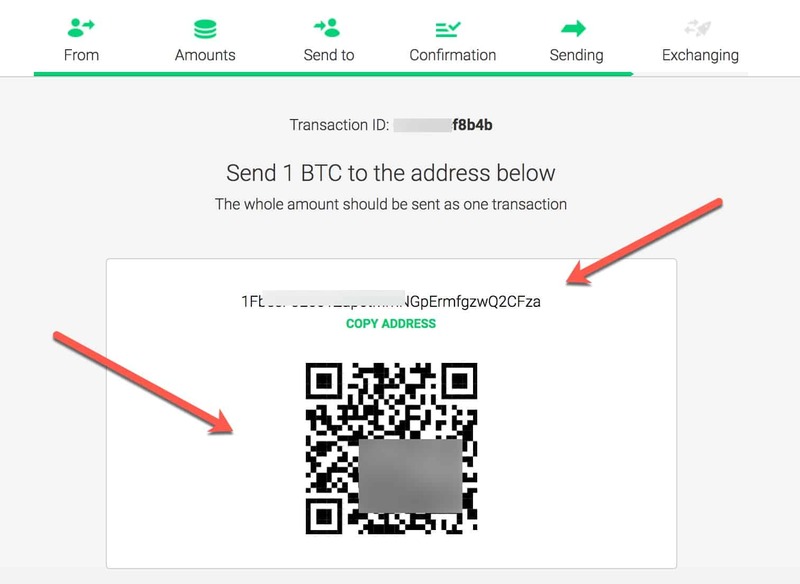 The Bitcoin wallet address is not necessary, but it’s useful in case a refund needs to be made. In this case, I’m transferring 0.5 BTC to ETH. 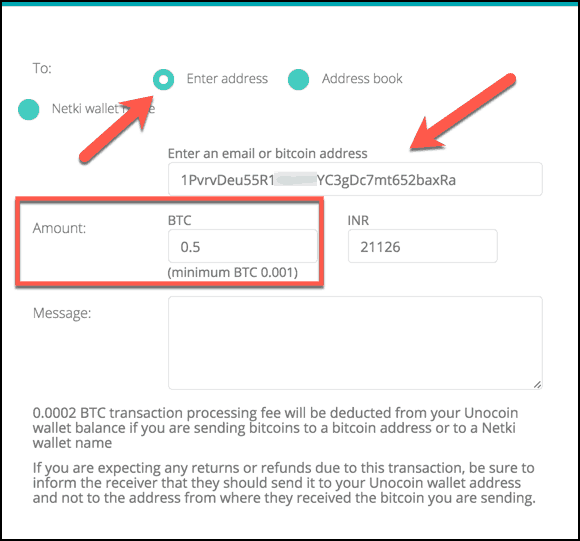 Once you have entered the amount & your wallet address, click on Start Transaction. On the next page, you will get the address to send it to. Note: You only have 10 minutes to make this transaction. That means that Bitcoin has been successfully converted into Ethereum & it has been transferred to your Ethereum wallet address. The Ethereum wallet in your Coinbase account will show the new amount, but it will be in a ‘Pending’ state for about 30 minutes until is it verified by the network. You can read more about the process here. However, you don’t need to worry at this point, as within a few more minutes the transaction will be verified & your Coinbase Ethereum wallet will be loaded with the converted amount. Shapeshift also has a smartphone app that you can download from the below link. Update: ShapeShift who earlier used to have no registration policy for using their services is now turning off that facility. ShapeShift is now introducing ShapeShift membership programme which will require you to have KYC. So accordingly make your choices !! Well, this is an example of converting Bitcoin into Ethereum. You can follow the same guide to convert Bitcoin into Nubits, Omni, Peercoin, Monacoin, or any other altcoins. If you have any problem making this exchange happen or have any query, feel free to ask me via the comment section below. If you have a tip or suggestion for me, feel free to drop an email via the contact form. You can also subscribe to our YouTube Channel for video updates! Yes, ShapeShift is genuine. You can also try Changelly at the same time & the one giving better conversion, you should use that. Can you please let me know if i need to send the bitcoin from shapeshift or changelly to zebpay,is this thing possible. 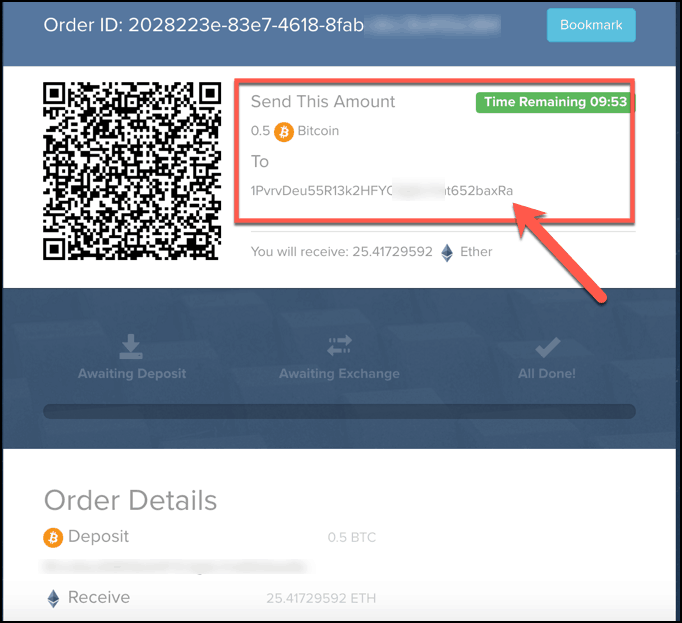 Zebpay only supports BTC addresses so when you wish to get BTC in exchange of any other supported currency you can put your Zebpay’s BTC receiving address in Changelly or ShapeShift. 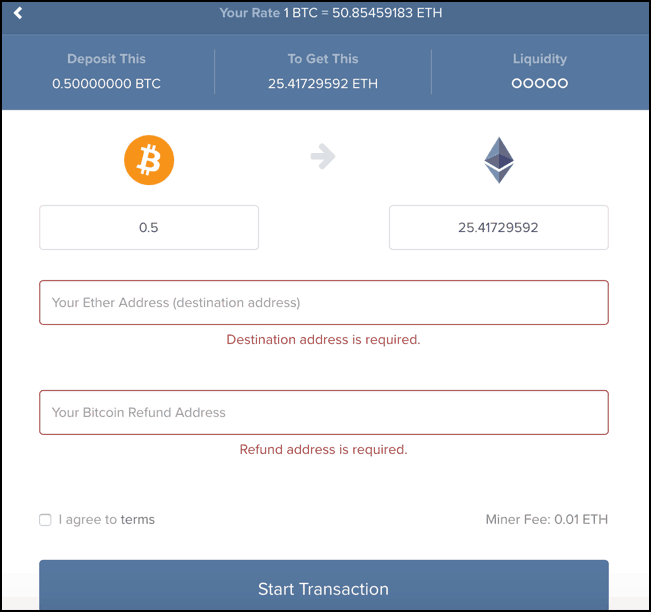 Can i also convert back my ethereum to btc using shapeshift? 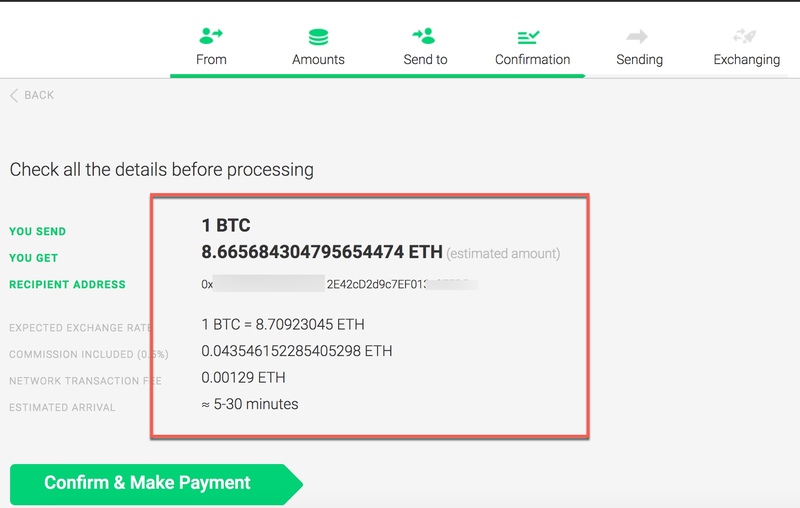 Follow the same process as shown below and you use it for Ethereum. I tried to make a transfer earlier from Coinbase to Binance and it is still pending from 3-4 hrs ago. I would like to know if the sites you are recommending will be faster. I want to make more purchases but unsure if i should wait til my 1st external transfer is confirmed. No matter what service you use Bitcoin’s blockchain is having a heavy load. Expect delay plus the delay from any exchange services. can i transfer bitcoin from changelly to binance directly? I need Help!!! I followed the instructions on how to change bitcoin to ETH on Changelly but I accidentally converted my bitcoin to EXP. I don’t even know what that is. When I check my Ether Wallet there is nothing there even though that is the address I made the conversion to. What do I do? How do I find my EXP currency? then you might have put your ETH address for receiving your EXP. Sadly only Changelly guys can help you. Please be cautious about such things!! Appreciate you sharing your knowledge and insights. Thank you.